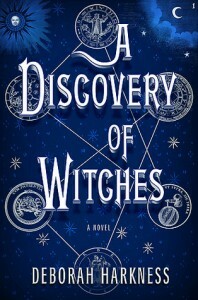 Please note: This is my review for the second book in this series, and so contains spoilers for the first, A Discovery of Witches. You may wish to read my review for that book instead! 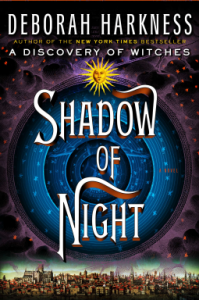 The story of Shadow of Night begins as soon as A Discovery of Witches ended. It has been quite a while since I read the first book and there’s not much in the way of re-setting the scene, so it took a while to get back into Diana and Matthew’s story. Diana Bishop is a scholar and historian, and is also from a long line of witches. Her magic is different to that of other witches, however – spellbound by her parents as a child before their murder, she has only recently released her power but cannot control it. On top of this dangerous inability to control her powers, she has angered the ruling Congregation by falling in love with a vampire, Matthew Clairmont – a relationship which is forbidden under the covenant binding witches, vampires and demons. Fearing they are in danger, Diana and Matthew use Diana’s timewalking ability to travel back to 1590, where they are fortunate enough to encounter members of Matthew’s household and family who accept them as time travellers and help them to fit into society. They must find a witch willing to help Diana discover and control her powers, as well as try to locate the mysterious manuscript “Ashmole 782”, which must be kept from falling into the wrong hands. As with A Discovery of Witches, there was soooo much detail. The detail in the first book was overwhelming at times, but in Shadow of Night, it actually works really well. Diana is discovering the strange new world of the 1590s and even though she has studied that period for a long time, actually being there totally overwhelms her. The detail with which this new world is described is amazing, and the characters of the School of Night, the gathering of witches in London and the individuals like Queen Elizabeth herself are colourful and make the story very enjoyable to read. We don’t quite get to meet Will Shakespeare but there are plenty of other personalities to mingle with. It took me a long time to read this book for some reason, and I suspect it may be the level of detail that made it a slow read – having to take in every scene and determine what was going on. I wanted so much to love Shadow of Night, and I did love the portrayal of Elizabethan England and Prague, but there were a few things about the story itself that really bothered me and made me enjoy the story less than it probably deserves. I still love Matthew, even with his melodramatics and brooding rages – such a romantic! I still rather dislike Diana as having a shallow emotional range. There are some quite heart-wrenching events through this story, and she comes through them with a brief mention of being upset but recovers very quickly and gets on with things. I know, some people are really like that, but I thought the story could have been a lot more emotional, both in happy and tragic times. Apart from the problems I had with Diana’s character there were a few things in the story itself that I found slightly annoyed me. Diana and Matthew are told not to try to change anything in the past, as it could seriously affect the future, but as soon as they arrive they start trying to save witches under trial and affecting other decisions and events. Matthew also seems sure that Diana is keeping secrets from him, for no good reason that I could see. I was slightly confused with the whole time travel mechanics – the Matthew of the past just mysteriously ceased to exist for a year while the “future” Matthew is there, and then after they leave he just pops back into place into a world where quite a lot has happened. It felt like a slightly clumsy way of dealing with being in a time he was in previously. The story itself moves at quite a pedestrian pace, at least until close to the end when everything comes to a head and it was difficult to put the book down. I just wasn’t as gripped by the story as I wanted to be, especially since I was enjoying reading about life in London and Prague as well as the magic that Diana was learning about. If you enjoyed A Discovery of Witches, you’ll also enjoy this next instalment in the series. Just be ready for a truckload of details! What did others think of Shadow of Night? I loved Discovery of Witches. This one,.. not so much! I will still be waiting the third book with great anticipation though! Yes, I do think I’ll be reading the third one just to find out what happens! First, I did hop a plane last fall and was able to tour Oxford and London with fellow fans. The thing I most enjoy about this book are the details that Professor Harkness leaves for us to explore. Anyone who is interested in mythology, history, art, poetry, geography, even religion will have new worlds to explore. Virtually every name and place mentioned in these books has some meaning. I’m eagerly awaiting Book 3, but in the meantime, I’m following news that this might be made into a movie. I would love to see Richard Armitage as Matthew. You can check out that crusade here: http://www.armitage4clairmont.com or http://www.facebook.com/armitage4clairmont.